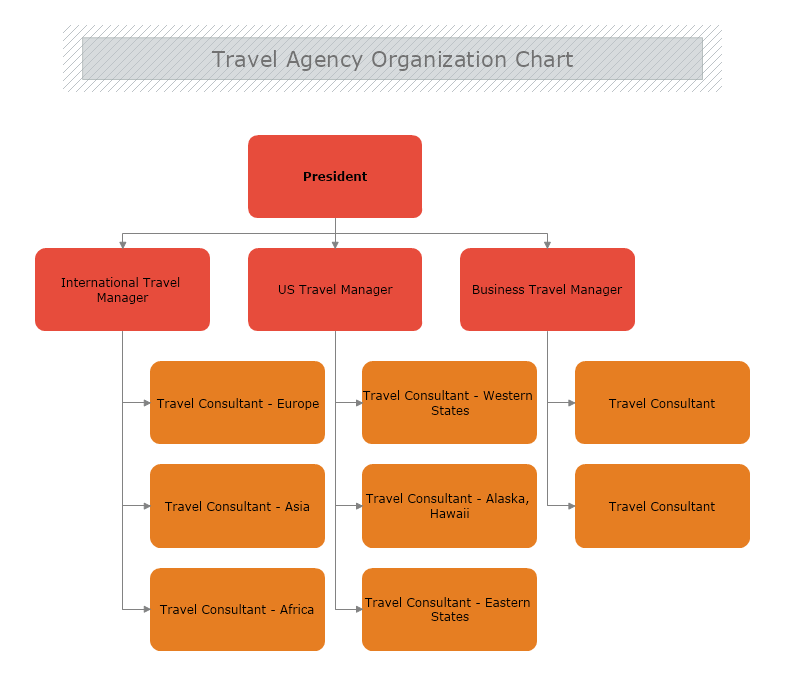 Organizational charts are one of the most efficient ways to describe the work relationships between the people or the departments within an entity. They help outsiders get a good understanding of the organization's dynamics, as well as each employee better comprehend how her/his role matches the bigger picture. A well-crafted organizational chart can help in many ways. It can be a tool used by the HR department to help them make decisions on transitioning people from one position to another, or help them realize the need of additional training which can be provided to improve the working process of the company's employees / departments. Organigrams could also be used to distinguish the working tasks between the different positions, to show who is reporting to whom. What do you need to create an organizational chart? Names and positions of the people/departments within the organization. An organizational chart can illustrate either the whole company structure, one division of the organization, or just a single department. What organigram you will draw will be based on what information about the company you need to visualize. If you are looking to improve the work of a specific department your organizational chart will include only this department, described in its structural detail. Within the chart you can also include a few representatives from related departments that are somehow involved in the work of the organizational unit you are trying to improve. If you'd like to enlarge or curtail your personnel, having the organizational chart of only one department won’t help you see the full picture. In this situation you will need more general organigram that illustrates the structure of the entire company. Example: let's say you have a relatively small international traveling agency with a few different divisions based in various locations, and due to an incensement of work you would like to extend your company. Having an organizational chart can help you decide if you need to open another office on a different location or if you can simply hire additional people at the current offices. Every company has a founder who (in most cases) becomes the President/CEO of the organization. Different companies have different number of founders. It could be a single person who has formed the company and started the business, or a few friends who has joined their ideas and co-founded the organization. In our example there is a single President that stands on top of the organizational structure. divisional – divided based on the type on work each division delivers. Within this example we use a divisional structure. Step 3: Define the employee’s position within the organization. So far we have the structure of the people supervising the company’s work. Nonetheless, to be able to see the whole picture we need to list the employees. In this example we have one representative of each major destination – Europe, Asia, and Africa. We also have one representative within the US Travel division for each region of the US – Eastern States, Western States, and Alaska and Hawaii, and two representative handling the work in the Business Travel division. Once we have the entire organizational chart it becomes much easier to take a decision whether to expand the company by opening a new division or to simply hire a representative to take over a new destination.